Vote forAlbany, WATop Regional Destinations Which are Australia's must-visit destinations? You help us decide. This little gem that sits right on the Southern Ocean on WA's south coast boasts a remarkable coastline that contrasts significantly with the topographic landscape shifting inland, where tall trees soon give way to open paddocks. This variance combines to make for a flexible spot for enjoying a range of aspects of natural scenery, however most will likely gravitate towards the excellent beaches to which Albany plays host. Albany boasts an interesting blend of terrains that brings to mind verdant parts of England except with the added benefit of beautiful stretches of sand – embodied by the clean shores of Emu, Little and Middleton (with its lovely scenic boardwalk trail) beaches – added in for good measure. Long one of Australia's best whale watching destinations, the off-season for the giants' migratory period still brings along with it many of the benefits of the south WA coast; the summers here are typically more pleasantly cool than capital Perth, and there's relatively little rainfall to worry about from January through March. This is a good thing, as Albany is all about enjoying the Great Outdoors, and many of its main activities and attractions will have you exploring, drinking and dining in the open air. In addition to the above, those looking for something more upbeat can instead strike out and explore the beauty of the Stirling Range National Park either via 4WD or on foot for some dramatic views – including that provided by Bluff Knoll, the tallest peak of the bunch that offers a wonderful 360° panorama. Add in a dose of history of both the maritime (highlighted by the Discovery Bay Whale Centre) and military (National ANZAC Centre) varieties, and you've got a great all-rounder destination that can be reached via a 1-hour flight or around 5 hour drive from Perth. Looking to pay a visit to Albany but not sure what to do? Here are a few of its most essential experiences. What's new in Albany in 2017/2018? The town's Tourism and Information Hub is set for a major revamp and relocation to provide even more helpful advice for visitors. Central floral hub Queen's Gardens had its four-year-long restoration work completed and now is completely revitalised. 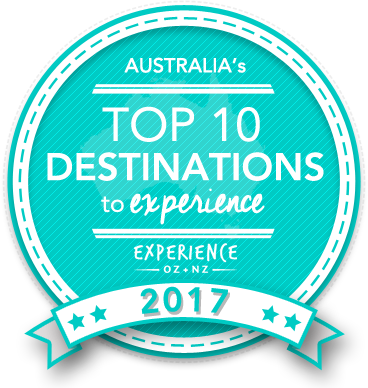 Is Albany Australia's Top Regional Destination to Experience for 2017? Vote now for the chance to WIN an epic trip to one of Australia's top destinations!